I’m not a participant, I participate! 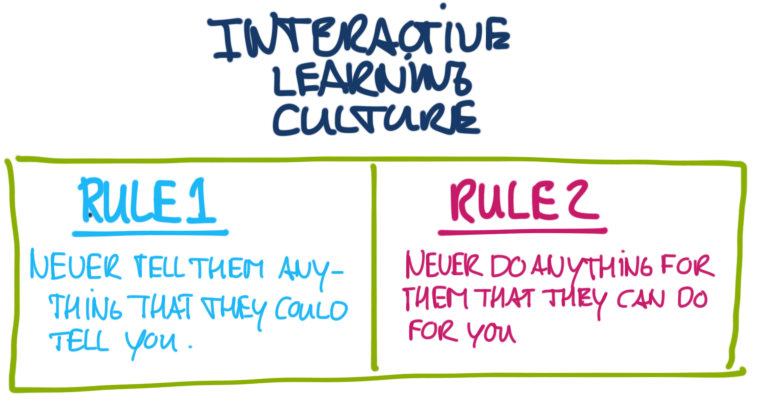 When designing & delivering training programmes, my biggest challenge is to create a learning culture of shared responsibility for the learning outcomes with the participants. Or maybe I should say ‘facilitate’, rather than ‘create’ a culture like that. Sometimes it’s obvious that some participants are in ‘tourist mode’, just playing along with wathever the trainer is telling them to do, but not really into it. Others might even be in ‘resistance mode’, because they are only at the training because their manager sent them. Luckily most of the time, people are really participating, but -still- it could be more. Actually, when I talk about ‘participants’, I think I’m already missing the point. Calling somebody that, is already nudging them into lean-back-mode. People should not be participants, but be participating. Opening up parts of a training programme, including the design, preparations and delivery I think facilitates a participative culture. As I said, this doesn’t solve it all, but I think it’s good to keep in the backs of our heads (or maybe rather on the tips of our tounghs). So ask questions, instead of giving answers. Q: To all trainers, programme managers, ‘participants’, what do you think about this? Thank you very much for your comments Denis, I love it! Absolutely agree, and will change the ‘rules’ in a next post.